It got there in the end. By full-time, quality (in one half, at least) beat out quantity (of away supporters in the ground), 3-1. With that, we'll set aside the Europa League for two weeks before traveling to Belarus for matchday two. That brings us to the task at hand ahead of us: Chelsea away. Stamford Bridge has not been a happy hunting ground for Arsenal, even if the media would like you to forget that Arsenal have handled the Blues well otherwise since the start of last season. Antonio Conté has bested Arsène Wenger just once in four tries, but that was the sole meeting at Stamford Bridge out of the four. This match is going to tell us a lot about how the rest of the season is likely to unfold. If Arsenal win, then reports of their demise would have been greatly exaggerated. If Arsenal lose a close one, it's probably still going to fit straight into the media's #narrative. If Arsenal perform like they did at Anfield three weeks ago, then the media's drum-pounding about the club will never end, ever again. If it's a draw, well, nobody really wants that. Draws don't sell newspapers. It's obviously not ideal to play a Sunday afternoon match after a Thursday night match, especially one that started an hour later than it was supposed to. However, that's just something we're going to have to get used to this season. It's not like the Saturday lunchtime kick-offs after Wednesday European nights that we've had in the past are much different. Still, Arsenal was able to rotate the squad plenty on Thursday, which means the likes of Mesut Özil, Alexandre Lacazette, Danny Welbeck, Aaron Ramsey, Granit Xhaka, and Laurent Koscielny (though, he was also suspended in Europe) can come back into the XI. I've heard rumors of Theo Walcott picking up a calf injury (I believe the TV cameras showed him with an ice pack on the bench after his removal.) There are some doubts on the fitness of Özil and Ramsey as well, but Arsène Wenger said earlier that they should be available. I think the biggest question is how many defenders Wenger chooses to start. Twice this season now, Wenger has switched back to a back four at halftime. The switch worked on Thursday, but seriously did not at Anfield last month. The beauty about the predicted XI I pick below is that I'm hedging my bets and, depending on where Kolašinac slides in, it could work for either formation. Predicted XI: Čech, Monreal, Koscielny, Mustafi, Bellerín, Kolašinac, Xhaka, Ramsey, Özil, Alexis, Lacazette. When the hell did Chelsea buy Danny Drinkwater? September 1, apparently, for £35 million! Anyway, he's struggling with a calf problem and is likely not yet fit to make his Chelsea debut. Chelsea, of course, rotated plenty in midweek as well, and the likes of David Luiz, Eden Hazard, and Álvaro Morata are likely to come back into the starting XI. Davide Zappacosta is making a push to start in place of Victor Moses after scoring on his full debut Tuesday night. Predicted XI: Courtois, Azpilicueta, Luiz, Cahill, Zappacosta, Alonso, Bakayoko, Kanté, Pedro, Hazard, Morata. Arsenal maintained their 100% record at home with their 3-1 win over Köln yesterday, but they have nothing to show for their travels so far this year. The Gunners are winless away from the Emirates, though the sample size remains small: just the losses at Stoke and Liverpool to consider. Arsenal played well at Stoke and had an equalizer ruled offside, but they didn't show up at all in the other road game. Arsenal have picked up three wins in four tries against Chelsea since the start of last season, including two wins at Wembley, mentioned above. Though, again, if you want to get really technical, it's two wins and a draw. In last year's FA Cup Final, Alexis Sánchez opened the scoring early with a controversial goal in the fourth minute. Chelsea were reduced to 10-men on 68 minutes when a Victor Moses dive in the box was rewarded with a second yellow card. Even shorthanded, Chelsea had an equalizer through Diego Costa on 76 minutes, but Aaron Ramsey gave Arsenal his second FA Cup winning goal in four years just three minutes later. In the Community Shield to open this season, not-sent-off Victor Moses opened the score just after halftime, but it was Pedro who saw red in the 80th minute. Sead Kolašinac opened his Arsenal scoring account on the ensuing free kick to send the match to penalties, where Thibault Courtois idiotically went second and skied his spot kick. Arsenal won 4-1 on penalties. Arsenal have not won at Stamford Bridge since that time John Terry fell down, which was October 29, 2011, a 5-3 Arsenal win. 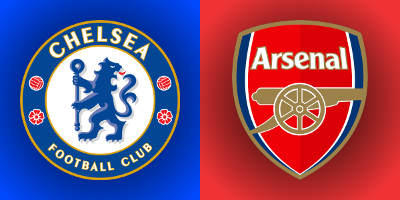 Chelsea have scored at least twice in eight consecutive games against Arsenal at the Bridge. Arsenal have only scored in three in those eight matches; one of them was the aforementioned 2011 win, another was in January of 2013, in which Theo Walcott scored a second half consolation goal as Chelsea won 2-1. The other was last year's match, where Arsenal scored a meaningless goal at the death. The referee is Northumberland-based Michael Oliver. Arsenal's record with Oliver, overall, is quite poor. In fact, he was in the middle for many of Arsenal's worst moments this calendar year: 3-3 at Bournemouth, 0-3 at Crystal Palace, 0-2 at Tottenham. In the league, all-time, Arsenal have a record of four wins, seven draws, and eight losses with Oliver in the middle. Arsenal did win their most recent match with Oliver, 3-1 over Everton on the final day of the regular season, though they did not escape a red card to Laurent Koscielny in the process. To be fair, that call was correct, so you can't blame Oliver for it. Michael Oliver was in charge of Arsenal's league win over Chelsea last season, however, though that came at the Emirates. It's on the road where Arsenal tend to struggle with Oliver, even as their road record in big away games has, by and large, improved in recent years. Chelsea saw Oliver five times last season, winning four and losing only once, at the Emirates as mentioned. They defeated Tottenham 2-1 in November, Bradford City 4-0 in the FA Cup in January, Manchester United 1-0 in the FA Cup in March, and West Bromwich Albion 1-0 in May. John Painting is a contributing writer to the Modern Gooner and a retired midfielder. You can follow him on Twitter @zorrocat to debate whether or not that just means he played in high school.